Luxury Two Story 3 Bedroom, 3 bathroom Villa. TV`s in all rooms and loft sitting area upstairs. All smart TV`s. Built in BBQ on downstairs lanai with grass surrounded around the lanai, steps to the large swimming pool with waterfall and Jacuzzi. 6/28: Luxury kitchen, fully loaded. 8/28: Waikoloa Beach Villa front gate. 9/28: Corner villa located in privacy, two story with lawn area surrounding the downstairs lanai with private built in BBQ, kitchenette. 10/28: Front entry of villa. 12/28: Workout facility on property. Located next to one of the two pools on property. 14/28: Sunset at A Bay right across the way, walking distance. 15/28: Waikoloa Queen`s Shops..... Starbucks and much more. 16/28: Master bathroom two sink vanity. 17/28: Kitchen with full size refrigerator and wine cellar. 19/28: Garage, C building, one is for your private use. 20/28: Downstairs guest powder room. Provided with privacy for the main floor. Full size washer and dryer next to the bathroom in it`s private closet. 21/28: Master bathroom, full size large, deep tub, walk in glass, with pebble shower flooring with glass walls. Powder room with privacy. Double vanity with perfect lighting. Enjoy paradise at our luxury two story villa located on a private corner of the complex, just steps away from the beautifully landscaped pool. Enjoy the large outdoor lanai complete with outdoor kitchen space and a private barbeque. The poolside 3 bedroom, 3 bathroom units are the largest units in the complex with a total of 1874 sq feet of indoor space and 346 sq. feet of outdoor lanai. The well stocked kitchen boasts Granite counter tops and Stainless Steel appliances. Guests enjoy free telephone calls to the U.S mainland or Canada, high speed internet and cable television. Our guests also enjoy free parking in our enclosed garage and the use of mountain bikes, golf clubs, boogie boards, beach chairs and coolers. Everything you could need to enjoy a day in paradise. Our villa is conveniently located across the street from the Queens Market Place which offers Shopping, Dining, Starbucks and a Gourmet Food Market. You are also just steps away from the Kings Shops which include upscale stores such as Louis Vuitton, Coach and Tiffany’s. There are two Championship golf courses nearby. The Waikoloa Beach Villas are located a short walk away from the beautiful Anaeho’omalu Bay. “ A-bay “ is a palm fringed salt and pepper beach that offers water activities, kayak / paddleboard rentals and great snorkeling. It is a great family friendly beach with its swaying coconut palms and calm waters. “ A-bay “ is also home to the Lava Lava beach club which is a great place to have dinner and watch the beautiful Hawaiian sunsets. 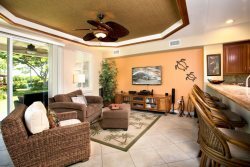 This poolside condo is in a secure resort with a gated entryway and located in the heart of Waikoloa Beach Resort. Each bedroom has full size dressers, closets and space to live comfortably. Each room has their own tv center, with the apps commonly used. Comfortable bedding and linens provided. Starter amenities are provided for your first day or two.